The title of this article should be “Broadcasting Final Tables Live, with a One-Hour Delay While Showing Hole Cards, is the Future of Poker." That may be a mouthful, but it is necessary to add the amendment as you'll soon discover. In addition, broadcasting live technically isn’t even the future since it already happened in January when the final table of the PokerStars Caribbean Adventure Main Event was shown on ESPN2 with a 60- to 90-minute delay. 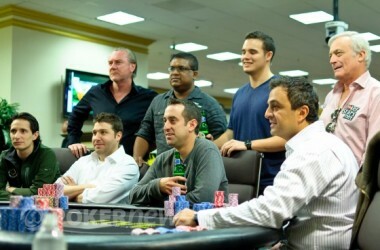 Most recently, the same feat was duplicated when the Bicycle Casino aired the final table of The Big Event on their popular Live at the Bike webcast. While it would be nice for a final table to be broadcast live with hole cards, there are obvious security concerns that make it implausible (cheating, collusion, etc. ); however, by airing it on a slight delay, the action has a chance to play out so that the aired hands no longer pose a security risk. On the flip side, it does provide the players with valuable information they can use to their advantage, an issue I’ll address later in this article. For the sake of this piece, whenever I say “live,” I’m implying that a short delay would be observed. With that said, let me tell you why I think broadcasting final tables live is a good idea. The benefits of a live broadcast are overwhelming and hard to ignore. First, playing a final table live ensures that no one will know in advance who the winner is, and this is much more entertaining. This is in direct contrast to programs like the World Poker Tour, whose tournaments air months after the event has concluded. This time gap provides the poker media, PokerNews included, the opportunity to publicize the tournament’s outcome before fans get the chance to enjoy the action. Think of it as you would a football game. It’s not as much fun to watch a game when you know who wins compared to watching the action unfold before your eyes. The concept applies to poker tournaments, as well. Second, a live broadcast allows the friends and family of the final tablists to share in their loved one's special moment. For example, The Big Event final tablist Bryan Leskowitz hailed from the East coast and obviously not all of his supporters could be in California to support him. By broadcasting live, people with vested interest were able to tune in and share in a truly one-of-a-kind experience. Finally, broadcasting live opens a whole new window of opportunity for sponsors, advertisers and the like. I'm sure you can use your imagination as far as that is concerned. While airing a final table live seems like a good idea, some critics argue that doing so is detrimental to the players. How could this be? Supposedly, it provides players with advantageous information they can use against their opponents. For example, during the final table of The Big Event, Joe Hachem often mixed it up with Taylor von Kriegenbergh by using three- and four-bets. By broadcasting live, von Kriegenbergh could simply wait for the delay to pass, watch Hachem’s antics, and adapt accordingly. While this argument is certainly true, the counterargument is that every player has this option, so no unfair advantage is bestowed on one player over the others. If this explanation doesn’t satisfy the critics, I wonder how they'd feel if the players were allowed to pick and choose the hands they shared, which is exactly what the Bicycle Casino offered on its Live at the Bike webcast. This allowed the players to reveal or conceal whatever information they deemed fit. I’m a fan of this option, as were all the players at the final table, and I believe it should be offered in any live broadcast format. "I started out in poker producing live web-streamed final tables for WSOP Circuit events. At the time, this is 3-5 years ago mind you, it was very difficult to get poker players much less sponsors to comprehend the idea of a web-streamed LIVE poker tournaments. To their credit, ESPN grasped the future of broadcasting and consistently backed the ESPN360 broadcast regardless of viewership. In recent months I have been amused at how the poker community has come to embrace web-cast as the 'next big thing'. I smile to myself knowing the long hard road it has been to get advertisers and viewers alike to grasp the game-changing aspect of internet broadcasts. The irony is most people have forgotten about my experience producing since I stepped in front of the camera for PokerNews, but the same ethos of creating content that is true to the internet is what I think keeps PokerNews ahead of the game in terms of our web-based video content. The internet is infinite. It is what entirely what viewers and websites make of it." Given that, it’s hard to believe we won’t see more final tables of major tournaments broadcast live in the near future. Perhaps even at the World Series of Poker. My sentiments are largely echoed in the poker community and among many of the top pros. While that is all well and good, the big question is: What do the fans think? After all, final tables are broadcast for their enjoyment. Ever since Full Tilt Poker banned more than 400 accounts from its online poker site last year for using poker bots to cheat its games, the menace from the nefarious online cheating devices continues to sprout. With improvements in bot program technology that increases bots' artificial intelligence, those using sophisticated bot programs now play with a very significant edge over those online players playing honestly. Michael Josem, a head security adviser at PokerStars, announced that PokerStars, which has always been at the front in the online-poker-cheating war, is currently investing large amouonts of money to fight the ever-encroaching cheat-enemy. He stressed that "human" online poker players should be able to play and enjoy themselves on PokerStars without fears of being cheated. My take: Well, one thing I can say is that PokerStars seems to be the leader of all online poker sites when it comes to combating the huge cheating epidemic that has plagued all online poker sites. If any site can make a significant dent in the bots, it is certainly PokerStars. A few weeks after the wild and crazy ride that the John Racener/Sorel Mizzi/Shaun Deeb Chinese Poker fiasco took us on, we have yet another “out of the blue” cheating accusation, this time involving Team UB Poker’s newest sponsored pro, Prahlad Friedman, and two of the top online poker players in the world Isaac Haxton and Justin Bonomo. Friedman is known for speaking his mind –which is the nice way of saying he talks before he thinks—so it’s unclear if this is just a player on tilt, or if there is actually any evidence of possible wrongdoing on Haxton’s part. Of course, no reply would be complete without a one-on-one challenge at the poker tables being issued –the poker version of an 18th century duel– which Bonomo did by challenging Friedman to a $50/$100 NLHE match for 10,000 hands. Thus far we have not heard from Haxton, and there has been no follow-up from Friedman. Hopefully this time we receive a little more closure than we did in the Racenre vs. Mizzi episode.